The pattern of body fat typically displayed by males is linked to an increase in arterial stiffness. The pattern of fat distribution most common in the male body is linked to increased arterial stiffness in healthy individuals, research indicates. Stiffer arteries mean increased physical demand on the heart, which can eventually lead to heart disease. 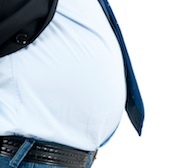 Males typically store fat in the midsection of the body, mostly in the abdomen. In contrast, females store more fat around the hips and thighs. Increased android (male-pattern) but not gynoid (female-pattern) fat is connected with increased arterial stiffness, researchers at Emory University School of Medicine have found. Cardiovascular researcher Frank Corrigan, MD presented the results at the American College of Cardiology meeting on Sunday, March 25. Corrigan worked with Arshed Quyyumi, MD, professor of medicine (cardiology) at Emory and co-director of the Emory Clinical Cardiovascular Research Institute. Corrigan, Quyyumi and their colleagues examined data from a group of 606 healthy individuals enrolled in the Emory-Georgia Tech Center for Health Discovery and Well Being’s personalized health program. Body composition was tested using a DXA (dual-energy X-ray absorptiometry) scan. Research elsewhere has suggested that fat cells in different parts of the body have different metabolic properties, and vary in their sensitivity to insulin. Corrigan found that the effect of male versus female pattern fat was independent of traditional cardiovascular risk factors and more traditional measures of body fat distribution, such as body mass index, waist circumference and waist-to-hip ratio. Statistically, ten pounds of extra android fat could predict a ten percent increase over average arterial stiffness. “The next step is finding out whether or not android fat mass is an independent predictor of cardiovascular outcomes,” Corrigan says. In addition, the researchers identified low bone density (measured in a scan of the pelvis) as a factor that is associated with less elastic arteries and poorer circulation within the heart. Low bone density was interpreted as a sign of oxidative stress, which affects blood vessels as well as bones. The results suggest that a detailed set of body measurements, incorporating bone density as well as fat, may provide more information about cardiovascular disease risk than conventional measures.